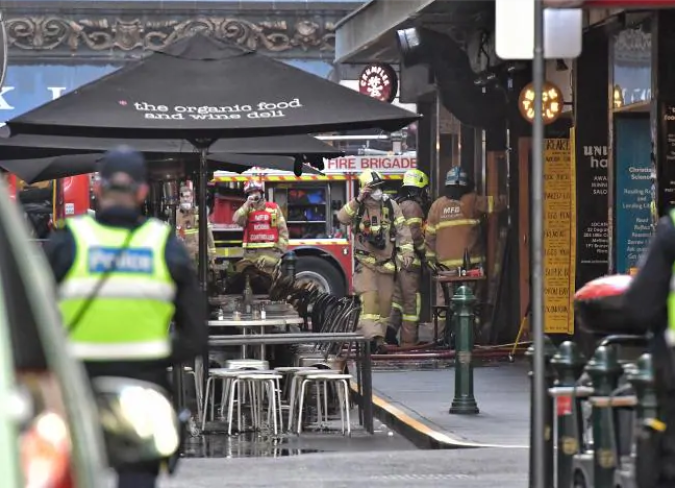 Degraves St has been cleared out as emergency services respond to the blaze, believed to be at Cafe Andiamo. Jasmine Tink, a barista at the near cafe The Quarter, said staff had jumped over counters to escape the fumes. “It started off really faint and no one noticed because the street often smells like smoke,” she said. 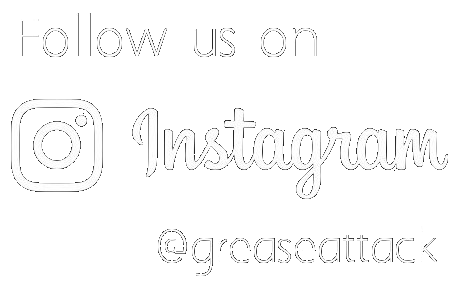 “Then about 2pm the smoke got really thick really quickly and people started rushing out and jumping over counters. MFB fire crews had trouble reaching the cafe due to traffic problems. Sprinklers in the cafe were activated. MFB said the fire appears to have started in the kitchen and spread through the flue and ducting. Smoke and water have damaged half of the cafe. MFB Firefighters in breathing apparatus extinguished the fire and used a thermal imaging camera to check for fire extension in the walls and ceilings. Flinders Lane will remain closed for some time. A Metropolitan Fire Brigade spokesman said firefighters had brought the blaze under control within 15 minutes but a significant amount of smoke lingered. People were advised to avoid the area. Ambulance Victoria was not called. Asbestos was found in the roof structure after hundreds were evacuated earlier this afternoon. Earlier flames spread to the roof, despite efforts from firefighters using an aerial hose to cool the area. 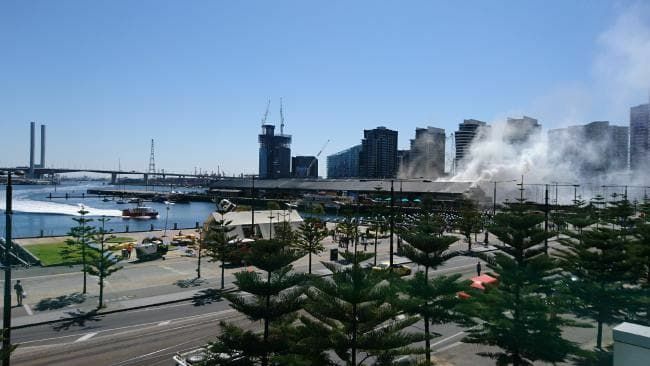 Fire fighters were called to the Harbour Esplanade venue to extinguish the blaze — which sent thick smoke billowing across the inner city just before 3pm. Two managers are being treated for smoke inhalation. The location of the building on central pier made access by the fire brigade difficult. Crews worked to ensure the blaze didn’t spread to other restaurants and shops in the precinct. Witnesses say the evacuation by staff was swift and professional. 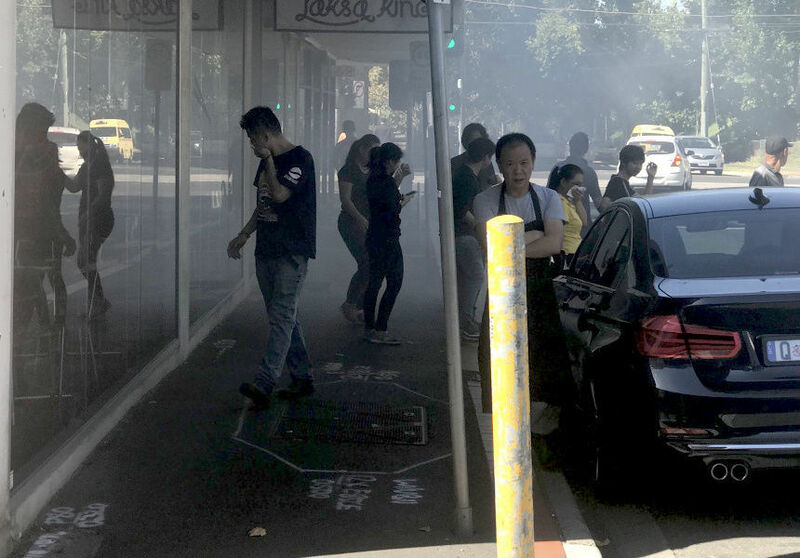 It is believed the fire started in a kitchen ventilation system at the venue, opposite Etihad Stadium and AFL House, just before 3pm. MFB assistant chief fire officer Darren McQuade said asbestos had been found in the building’s roof structure. “Precautions have been implemented to minimise contamination,” he said. All occupants have been accounted for and only two people have been treated by ambulance for minor smoke inhalation. About 200 staff and patrons were evacuated. There are 15 fire trucks, 50 fire fighters and one fire boat on scene. A fire boat was providing support from the water. Assistant chief fire officer Darren McQuade said people should stay clear of the area. “We’ve sent an advice notice out to the community asking them to keep clear of the area, saying there is a fire in the area and also that there is smoke in the area and they shouldn’t be concerned, that the fire fighters are working hard to extinguish the flames,” he said.